Remember that energy use really does all add up, so switch off all equipment, including printers and mobile phone chargers as well as the obvious computer and lights! Turning off any equipment over the Christmas break will help us meet our carbon reduction targets and reduce cost to the University over the break. 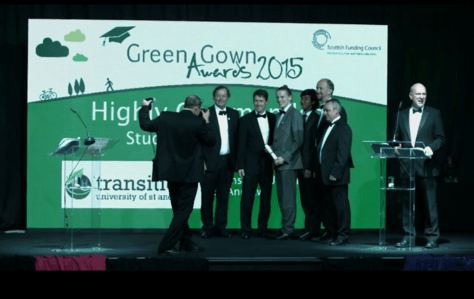 Members of Transition descended on Bristol (the European Green Capital for 2015) for the Green Gown Awards ceremony, held annually to celebrate environmental achievements across the Higher Education sector. Out of 10 nominated universities and student unions across the UK, Transition bagged the ‘Highly Commended’ award for student engagement. Congratulations to all for their hard work this year.